When you have a story to tell... community newspapers are the place to be! The Alberta Weekly Newspapers Association sets and follows through with a high set of standards for membership. The AWNA logo only appears in the masthead of those newspapers that adhere to the stringent levels of publishing standards and journalistic integrity. 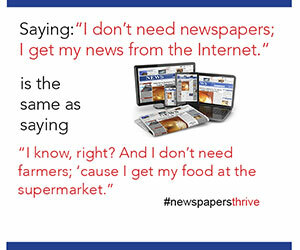 Community newspapers are the talk of the town because they cover the news not readily available elsewhere — stories that matter the most to rural readers. In addition, community newspapers are prepared in a professional and consistent manner. In fact, to achieve this physical quality on a weekly basis, community newspapers employ highly skilled people trained on the latest computer-assisted design and layout programs. Printed at modern presses, each are vibrant and attractive products eagerly awaited for their local relevancy and content. has a news-oriented front page, and advertising should not exceed 20% of total linage. has an editorial page or forum for readers or opinions. contains news of general interest and news and information concerning current happenings and passing events of a political, social, religious, commercial, financial or legal nature. contains local news of the area served by the publication as a major portion of its news content. serves a specific geographical area. has an office open to the public. has a dateline on each page that includes the name of the community served by the publication. publishes less frequently than a daily. has on average, not more than seventy percent (70 %) advertising exclusive of any pre-printed supplement. is carried on in accordance with the highest ideas, ethics and traditions of the newspaper profession. must provide an audited/verified circulation report to becoming a member. More information is available at AWNA on audit programs. must be in business for a period of one year before applying and then undergo a one year period of review before being eligible to become a member.